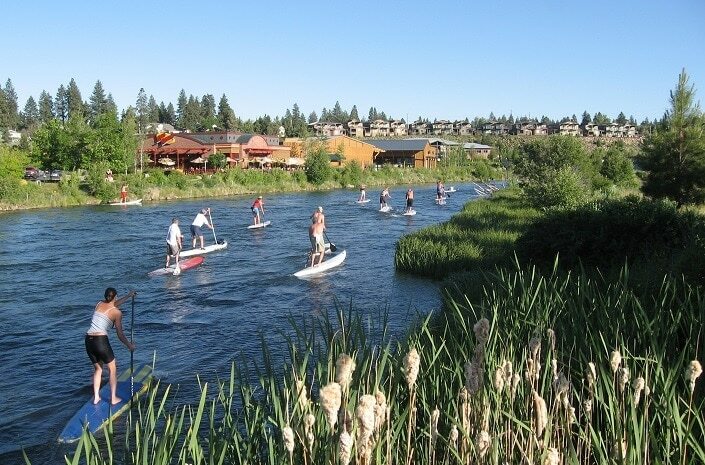 The Deschutes River in the center of Bend was beautifully restored by the developers of the Old Mill District in 2000 and is now a popular recreation, shopping and dining destination. The river is a daily summer home to “floaters” drifting down the waterway on everything from inner tubes to giant custom rafts and a variety of paddle boards, canoes and kayaks. Floating: The river is a daily summer home to “floaters” drifting down the waterway on everything from inner tubes to giant custom rafts. This is undoubtedly one of my favorite things to do on a hot day. This wasn’t possible 20 years ago, as the river was chock-full of a different type of floater – logs from the lumber mills that lined the banks. For information on where to go, visit the Bend Parks and Recreation website. Water sports: Want a little more excitement? Sometimes I’ll switch up the float and grab a paddle board, canoe or kayak from Tumalo Creek Canoe & Kayak on site, an easy way to explore more of the Deschutes River. The Bend Parks and Recreation District is even installing a new whitewater play area in partnership with the Bend Paddle Trail Alliance, which should be open this fall. Hiking: When the Old Mill District was developed, it launched an extensive river restoration project which allowed access to 14,000 lineal feet that had been off-limits for almost 80 years. I love hiking the extensive network of trails and loops ranging from 1 to 2.4 miles with one or all of my three rescued dogs, which connects to the greater Deschutes River Trail system. Trails include large interpretive signs that feature historic photos and information about the land’s logging and timber mill history. Bird Watching: While hiking one of the above mentioned loops, I’ve noticed it’s almost impossible to avoid seeing multiple types of birds. In fact, the Old Mill District has teamed up with the East Cascades Audubon Society to create a bird-watching program that includes an illustrated guide, annual guided bird walks and binoculars available for checkout at the small red “Ticket Mill” building at 475 SW Powerhouse Drive in the Old Mill. Never thought I’d become a bird nerd! Biking: In Bike Town USA, trails aren’t just for hikers, silly. On wheels of all kinds, the Old Mill’s trail system is an ideal place to entertain my son, niece and nephew. We start at Wheel Fun Rentals, which puts explorers in motion with a range of vehicles, including surreys, tandem bicycles, Norge boards, choppers, quad sports or deuce coupes. Volleyball: Maybe not the first thing to come to mind when you think of Central Oregon recreation, but the sand volleyball courts near the edge of the river are a great place to play. Players, spectators (there’s a comfortable viewing area) and kids (who doesn’t love a sandbox?) alike will have fun. Live Music: We are very lucky to have one of the top outdoor music venues in the country, Les Schwab Amphitheater. Located right on the river, this seasonal venue not only hosts top names in the music industry such as Dave Matthews Band and Phish, but also has free concerts featuring regional musicians nearly every Sunday during the summer season. Picnic, anyone? 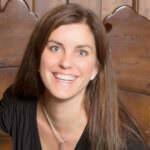 Dining: I often ask myself: Is lifting a glass of beer or a forkful of local food to your lips considered recreation? I think so. Especially when it’s done on the outdoor patio of one of the restaurants in the Old Mill District, overlooking the Deschutes River. Personally, I love the Anthony’s patio for fish tacos and a seasonally inspired cocktail. When I have the kids with me, we usually go for building our own personal pizzas at Flatbread Neopolitan Pizzeria. There’s a little something for every palate. Shopping: The well-planned layout of the Old Mill District’s retail shopping area, plus a mix of national and local retailers, makes it a fun place to shop. Walking around the beautiful riverfront surroundings, taking in the breathtaking Cascade mountain views and finding treasures that range from clothing to candy and beyond is my kind of shopping experience. 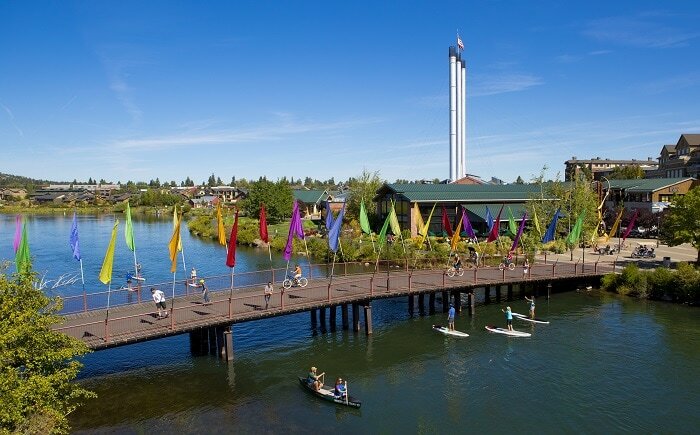 So whether you’re lucky like I am and live here, or are visiting for one day or one week, the Old Mill District is my recommendation for experiencing the best that Central Oregon has to offer – all in one place. Note: In the interest of full disclosure, the Old Mill District is a client of mine. It’s easy to represent a place that you love in real life!